Hair loss is common, but the causes are diverse. Here is an overview of some of the most common forms of hair loss. Sometimes the body’s defence mechanisms will misfire and cause rapid and irreversible hair loss. Alopecia areata is an autoimmune disorder affecting men and women of all ages, which can be triggered by infections, medications or hormonal imbalances, and can indicate a susceptibility to further infections in the future. 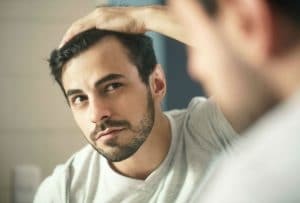 Hair follicles are attacked by the body’s immune response, causing initial patchy hair loss – and although it is not threatening to your health otherwise, it can be hugely distressing. Whereas alopecia areata appears in smaller patches around the crown, alopecia totalis and universalis are two much more severe forms of hair loss. Auto-immune in nature, alopecia totalis causes complete and total hair loss on the entire head (including the eyelashes and eyebrows). Alopecia universalis is the most extreme form of autoimmune alopecia, with complete loss of hair over the whole body. Androgenetic alopecia is more commonly known by its other name, the dreaded pattern hair loss. This is a hormonal condition caused by the breakdown of naturally occurring testosterone in the body into a compound named dihydrotestosterone (DHT). DHT binds to hair follicles, which makes them shrink, thereby stopping them from supporting and allowing long, ‘terminal’ hairs to grow. This is by far the most common form of hair loss, affecting up to 80% of men in their lifetime, and is irreversible once it starts. This is a form of temporary hair loss that occurs after the body has gone through some extreme physical or emotional shock – both of these causes can affect the body’s natural immune response, hormonal levels and metabolism. Telogen refers to the last stage of the life cycle of the hair, where the hair rests on the outside of the skin and falls out. Hair that falls out will make way for new, healthier hair, but the initial hair loss can be unsightly and unexpected. This type of hair loss is not permanent, but should be monitored for further complications (and paired with a nutritious, mineral rich diet as well as good rest). Folliculitis is an inflammation of the hair follicles, usually bacterial or fungal in nature. This causes the immune system to send white blood cells, antibodies and increased blood flow to the area, resulting in inflammation. The inflammation can suffocate the hair follicles, resulting in patches of red, itchy and swollen bumps around the hair follicles. If not cared for properly, this can result in permanent scarring of the hair follicles, irreversibly preventing hair growth. Medical advice is necessary in order to get to the root cause. Traction alopecia is any form of hair loss caused by excessive force or trauma to the hair – this includes trauma from pulling or twisting resulting from hair styling or can be caused by wearing tight wigs and headwear. The resultant trauma damages the hair follicles, temporarily halting growth. Fortunately, if caught early, this can be reversed. A much rarer form of hair loss than any of those previously described above, it is caused by the same fungus that causes althete’s foot – tinea capitis. It can cause painful, swollen and itchy patches of hair loss (often occurring in ring shapes, hence the name), and can be easily treated with anti-fungal creams.